Torridon and Applecross are two highlights of the northwestern seaboard. The scenery is grand and the views across to Skye are spectacular. It's the place for dramatic light and weather. (Sunshine is better still though!) Though 'day-trippable' from Inverness, outdoor enthusiasts in particular should plan extra time here. Writing about Torridon and Applecross is a reminder that, in Scotland, distances are sometimes not easily measured on a map. The north-western seaboard has the trick of feeling utterly desolate in places and giving a sense of remoteness out of all proportion to the relatively small distances from the nearest, say, fresh scone, wi-fi signal or decent pub. In reality, you can tour by Torridon and Applecross, coming back over the famous Bealach na Ba, in a long, long day from Inverness if you really must. But the winding and mostly single track roads - for example, through Glen Torridon - or round to Applecross - are quite demanding, unless you are a local. The mountains Liathach (left of centre) and the western end of Beinn Eighe from Loch Clair on a day of sun-and-cloud in Glen Torridon. Note the pale quartzite top of Beinn Eighe. This is a route description that starts in Glen Torridon and ends at the top of the famous Bealach na Ba on the Applecross peninsula. Because of the mostly narrow roads and the number of potential photo-stops, I strongly suggest you book accommodation in the area for a few nights. Torridon and Applecross hasn’t a lot of settlement, in turn meaning not a lot of accommodation. That’s part of its charm. In summary, the advice would be to check out Tripadvisor, map in hand. (And read other pages on this site that mention Torridon, obviously!) The Torridon Hotel is the top ranking place at the luxury end of the market, hereabouts, while the reputation of the Applecross Inn has been very secure for some years now. We stayed at Colonsay B&B at Arrina, west of Shieldaig, and we’d go again any time. Great value, friendly and at one point our hostess Kaylie casually offered us a bowl of squat lobster, ready prepared, in the same way as you might be offered a bowl of nuts or crisps/potato chips – little knowing I would normally be prepared to kill for a portion of ‘squatties’. Does anyone remember the old Glen Cottage, in Glen Torridon? For me, this little picture is a nostalgia-wallow. Below the soaring slopes of Liathach (of which the picture shows only a tiny slice) sits Glen Cottage. Now a respectable, no doubt tidy and well maintained, self-catering cottage operated by the National Trust for Scotland, in my young day it was an independent hostel, second of its kind in Scotland, run by the folk-singer Dave Goulder (with Liz). But the ceilidhs have long ago fallen silent. Glen Cottage was my base for the summer that year and I commuted down the glen to run the tourist information centre in the old village hall at Kinlochewe (now a cafe). Glen Cottage (pictured here) – self-catering in Glen Torridon, care of the National Trust for Scotland these days. But I wonder if the visitors know anything of its colourful story? And I recall it rained a lot. The incessant Torridon rain. Sometimes it was dry at the west end of the glen. And it was probably dry at Gairloch out on the coast to the north. But those impossible, looming, intimidating high sandstone terraced tops seemed to catch the clouds. Of course, hereabouts, it’s all mountain views…Ben Eighe with quartz screes like snow; Liathach like an upturned boat hull; Beinn Alligin with that gash across its stony face – the great stone-shoot of Alligin where the wind, I remember the day I climbed it, funnels up with a moan like an organ-pipe. All right, all right, that’s quite enough. Get a grip. Shieldaig. Ho hum. But you can look for sea eagles here. 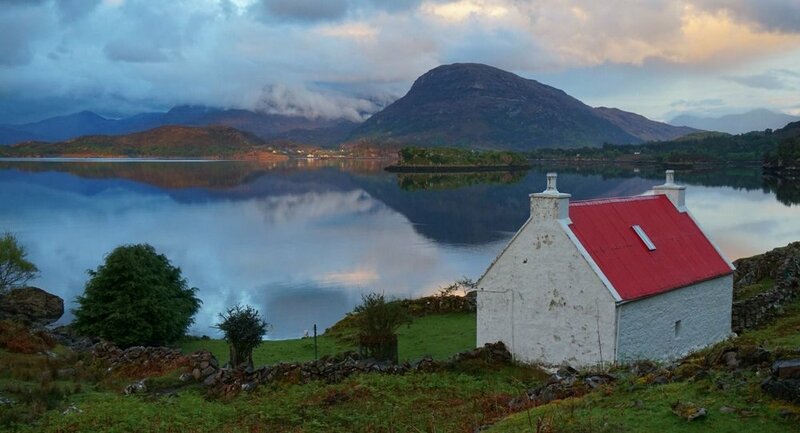 (Pictured here) Shieldaig, the little crescent of white houses overlooking the wooded island where the sea eagle nests, is picturesque enough, I suppose, though it has the air of second-home central for prosperous incomers, newcomers, part-time residents and other escapees. No, it’s nice, really. And worth a visit. (Pictured here.) Stop the car, stop the car. Look at the light. Look at the light. Fumble, fumble, change lenses, quick. Yes, I know this red roofed wee house features in quite a few visitor pictures, but the last of the sun is catching the edge of the village of Shieldaig in this eastward facing view, looking across Loch Shieldaig. During my Torridon residency all those years ago, there was no road from Shieldaig round to Applecross. You had to go over the famous Bealach na Ba, ‘the pass of the cattle’ that zig-zags up from the main Shieldaig to Lochcarron road. Completed only in 1975, the low-level road round the peninsula today is an ever-changing panorama. It twists and swoops at first through the Loch Shieldaig woodlands – scary blind bends, occasional oncoming vehicles with suicidal tendencies – before opening out with vistas over the islands of Raasay with Skye behind, as pictured here. An Cruinn-Leum beach, on the way to Applecross. (Pictured here) En route for Applecross, the beach at An Cruinn-Leum looks inviting. It must be – because there’s a surprisingly large carpark there. The Ministry of Defence also have set up next door and you may find the occasional clattering helicopter paying a visit nearby. Just a minor blight on Paradise. (Pictured here) …and so to Applecross, another little string of houses overlooking the sea. This is a peaceful wee place. You could just mooch on the beach, do a spot of sea kayaking or hill walking or eat delicious seafood at the busy and popular Applecross Inn. For many though, it’s all about the journey. (Pictured here) Coire a' Chaorachain - the corrie of the rowan tree - is one of a series of impressive corries usually seen from below, from the road to Lochcarron - but this view looks down from the Applecross plateau. At the 2000ft+ road summit, the more adventurous could put on their walking boots and explore the rims of some of the massive corries that face out east - easy access via the radio-mast access road that should be conspicuous from the carpark. (Pictured here) Characterisitc pinkish tinge to weather-worn Torridonian sandstone, a wet desert all around and below, the Bealach na Ba, on the first of the zig-zags dropping eastwards. And all that cloud at the very top, oh, that’s Skye, out there somewhere. All of the pictures on this page were taken in the month of May. Note the coastal sunshine giving way to showers in the afternoon on the Applecross section. On the Torridon section, as you can see towards the top of the page, it was just plain overcast, sometimes with rain - so I used a picture from another day! Typical Torridon! Ptarmigan nesting country at the top of the Bealach. Finally, on my last trip up to the head of the Bealach I was delighted to photograph ptarmigan. Why? Because for decades now I have been repeating in print the fact I once read long ago - that the Applecross road is the only road in Scotland that traverses nesting habitat of ptarmigan, our high-altitude grouse. And, at last, I saw one there. So that was good. Anyway, up amongst these wild and rubbly sandstone slopes of the Applecross Hills sometimes it is sunny. Sometimes you can see Skye. Sometimes it is just so perfect you can forgive anything. The Isle of Skye is a famous Scottish destination. The journey through Kintail is a scenic bonus, as is Eilean Donan Castle. Watch out for the goats though.